Recent work by Dr Marcus Dymond (Division of Chemistry, PABS) and Prof. George Attard (University of Southampton) with collaborators at the MAX IV synchrotron/ University of Lund, SE has been selected as a prestigious American Chemical Society Editor’s Choice article. The ACS is the world’s largest scientific society, which publishes 51 research journals across the chemical sciences. Each year the ACS chooses 365 articles (one per day) from across its many journals to make open access as part of the ACS Editor’s Choice program. On the 29th of October 2017 new research by Dr Dymond and colleagues was chosen. The paper, published in ACS Langmuir, looks at the membrane disrupting properties of aliphatic aldehydes. Aliphatic aldehydes are a class of chemicals that are used by algae as part of a defence mechanism however aliphatic aldehydes have also been implicated in a range of health related problems and disease mechanisms in humans. Notably aliphatic aldehydes are produced in cells as a response to reactive oxygen species (oxidative stress) interacting with lipids and there is an increasing body of evidence linking oxidative stress to global health challenges such as cancer, Alzheimer’s disease, obesity and many other health conditions. Aliphatic aldehydes are also produced when some fats are heated to high temperatures for frying food, raising concerns about their incorporation in the human diet. The researchers used X-ray diffraction facilities available at the MAX IV synchrotron SE to show that aliphatic aldehydes destabilise the flat structures formed by some of the most prominent lipids found in cell membranes. Typically cells contain large numbers of phosphatidylcholine and phosphatidylethanolamine lipids, which form flat lipid bilayer membrane structures that contain protein. The most widely known example is the plasma membrane, which encapsulates the cell and allows it to control chemical conditions inside its interior. However lipid bilayers are like microscopic springs that store elastic energy and it is thought that by controlling the composition of their membranes cells can regulate the elastic stress stored within. This enables cells to regulate the function of some proteins, which respond to elastic stresses in the membrane. In the particular case of aliphatic aldehydes the researchers found that as the concentration of these molecules increases the lipid mixtures form curved aggregates, which cannot form flat bilayers. 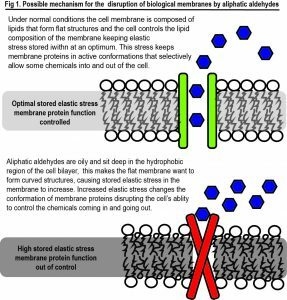 These results strongly suggest that aliphatic aldehydes cause high levels of elastic stress in membranes. 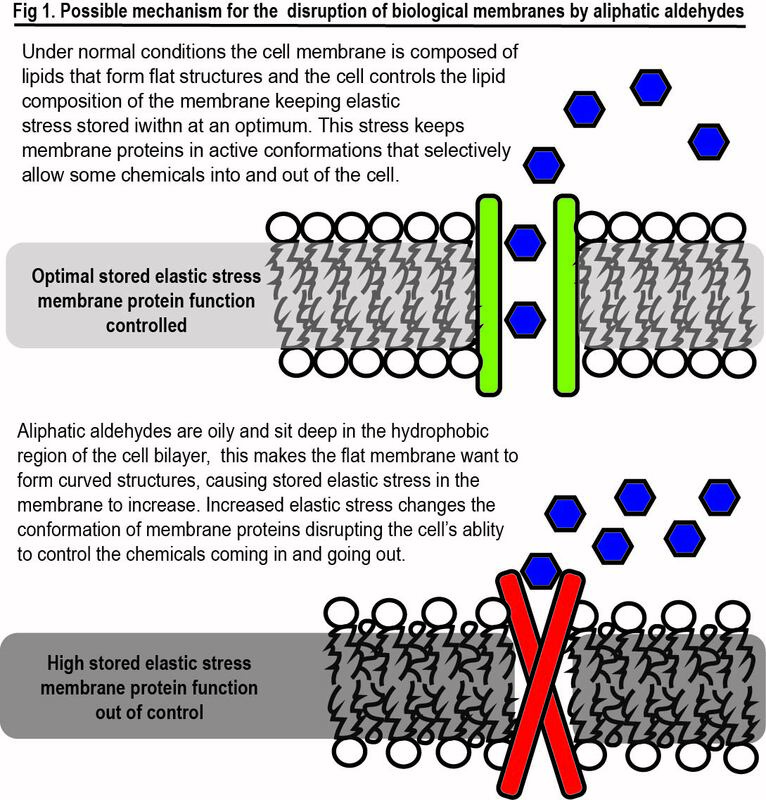 It is already known that high elastic stress can disrupt the activity of membrane bound proteins and the research suggests that the negative health effects of aliphatic aldehydes might be linked to this property as summarised in Fig 1.